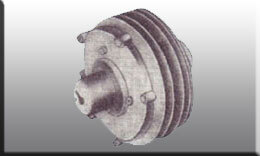 MAGCO CLUTCHES are used for smooth transmission of Mechanical Power. The clutches are used for smooth starting of machines in printing, paper industries, plastic moulding machines. Coil winding Machines, Textile machines, Rolling Mills, Cranes, Elevators and industries refrigerating plants etc. where starting torque is very high. Application of these clutches eliminates wear and tear of starters. The Rectifier transformer pannel can be supplied to convert 440/230 V AC to 24V DC if DC supply is not available.